Today's Metro features an article about a Camel Spider that apparently lives in somebody's house and killed their dog. This is a good example of how poor journalist coverage of science topics can be. First of all, Camel Spiders aren't spiders, they belong to a different order of arachnids, the Solifugae (Latin, to flee from the sun). Stories of these arachnids chasing humans are due to the fact that they want to stay in their shadow! 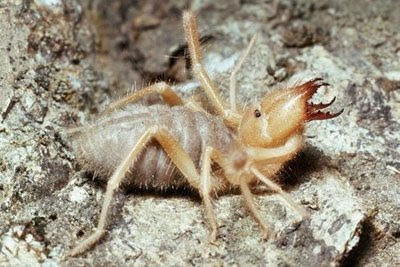 Camel Spiders are not venomous, and normal prey includes other invertebrates and small lizards.